In today’s post we show that UBS underwrote unmarketable Employee Retirement System bonds and bought them into the UBS Funds in 2008. Friday, we’ll show similar conflicts led UBS to underwrite unmarketable 2008 COFINA bonds and then stuff them into the UBS Funds. The Puerto Rican Employee Retirement System was acutely and chronically underfunded. Figure 1 is a plot of the PR funding ratio and the median of the 50 states’ funding ratios. The states median funding ratio fluctuated between 80% and 100% from 1990 to 2013 while the PR funding ratio was approximately 20% until 2008 after which it dropped even further. For context, the next three worst average funding ratios from 2007 to 2011 were Illinois at 51%, Connecticut at 58% and Kentucky at 59%. Merrill Lynch attempted to sell $7 billion of ERS Pension Obligation Bonds in 2007 but failed.1 UBS replaced Merrill Lynch as advisor to the ERS and was the lead underwriter of the ERS $1,588,810,800 2008 Series A bonds. See Figure 2. UBS was the lead underwriter on the 2008 Series A ERS bonds but there were 11 other underwriters including Merrill Lynch, Citi and Wachovia. We don’t currently have information on how much of the 2008 Series A ERS bonds UBS committed to sell but we do know that it purchased 41% of the issue into its proprietary bond funds. See Figure 3. We also know that UBS bought some 2008 Series A bonds into individual Puerto Rican customer accounts. The excerpt from the first page of the 2008 Series A ERS Offering Circular in Figure 2 includes the following language. The System currently contemplates offering additional parity Bonds (the “Series B Bonds”) in other jurisdictions. The Series B Bonds would be offered by means of one or more separate Official Statements and may not under any circumstances be purchased by residents of Puerto Rico. Page 7 of the January 29, 2008 Series A Offering Circular expands on the commitment to not sell 2008 Series B bonds in Puerto Rico. See Figure 4. 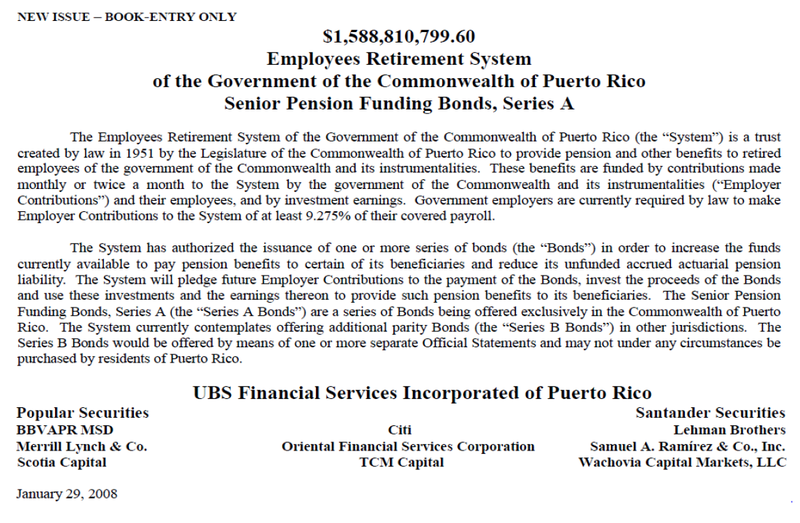 The language excerpted from the 2008 Series A Offering Circular in Figures 2 and 4 is unambiguous and was protection for Puerto Rican investors in the 2008 Series A bonds since the Series B bonds would be on par with the Series A bonds and would only be issued if the Series B bonds passed the market test. The Offering Circular for the $1,058,634,613 2008 ERS Series B was published on May 28, 2008. See Figure 5. Something dramatic happened between January 29, 2008 and May 28, 2008. Rather than only being available to non-Puerto Rican residents as promised four months earlier, the 2008 Series B ERS bonds would only be sold to Puerto Rican residents. See Figure 6. Figure 6. Excerpt from page 7 of ERS 2008 Series B Offering Circular. Not only was there no market outside of Puerto Rico for the 2008 Series B ERS bonds on the terms they were being offered, there was no market for the bonds on the island either. 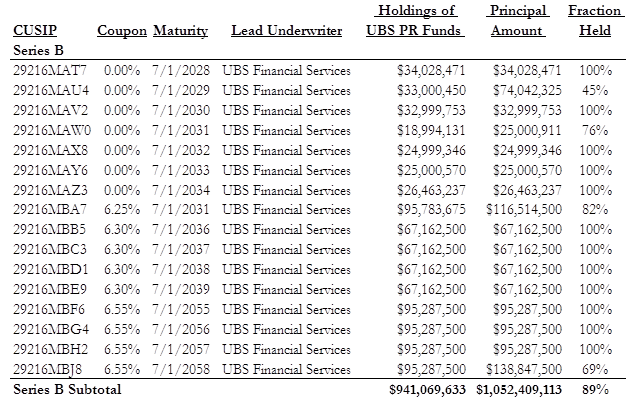 UBS bought 89% of the 2008 Series B ERS bonds into its proprietary funds. See Figure 7. The most interesting non-public documents in the UBS Puerto Rico municipal bond Fund saga will likely be the internal emails and memos at UBS and the communications between UBS and the ERS as they realize that there was no market for the 2008 Series B ERS bonds and the 2008 Series A ERS promise that the Series B bonds will not be sold on the island had to be abandoned. There was a third and final ERS bond series issued in 2008 – the Series C bonds. UBS was the lead underwriter of the $300 million offering in June 2008. See Figure 8. As with the 2008 Series A and Series B ERS bonds, the 2008 Series C bonds could only be purchased by Puerto Rican residents. See Figure 9. Figure 9. Excerpt from page 7 of ERS 2008 Series C Offering Circular. We don’t currently have information on how much of the 2008 Series C ERS bonds UBS committed to sell but we do know that it purchased 38% of the issue into its proprietary bond funds. See Figure 10. UBS’s trading in the ERS 2008 Series C bonds raise some additional questions. 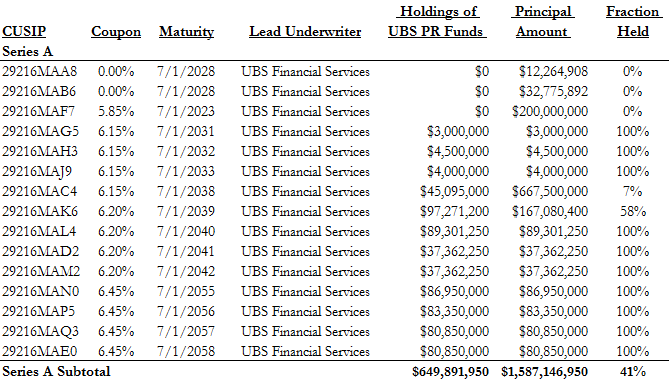 By January 2010 the UBS Funds held roughly $50 million of the Series C bonds maturing in 2043 and by September 2011 held $110 million. Unlike the Funds’ purchases of Series A and Series B bonds, the Funds’ $110 million purchases of this bond are not reflected in the EMMA data available here. We’ve written extensively about the UBS Puerto Rican Municipal Bond Funds. You can find our earlier blog posts here. 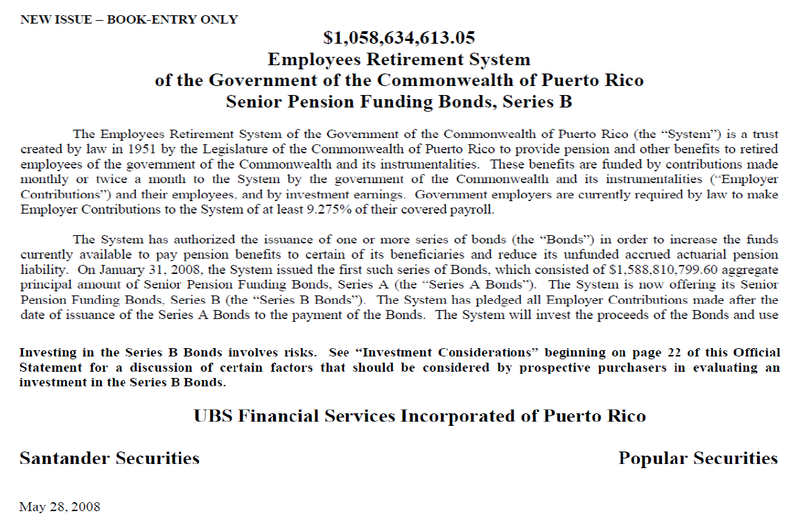 In a December 2013 post here we wrote of the conflicts of interest first identified by David Evans of Bloomberg (David Evans, UBS in Puerto Rico Pension Gets Fee Bonanza Seen as Conflicted, February 27, 2009, Bloomberg) which led UBS to stuff the Retirement System Bonds into UBS’s Funds. 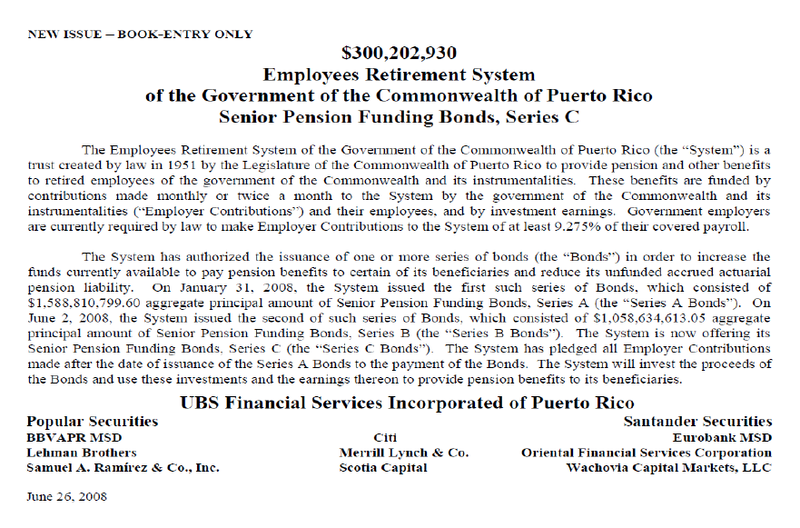 1 Near contemporaneous analysis of Merrill Lynch’s failed attempt to underwrite ERS bonds and the harm to ERS caused UBS’s subsequent involvement can be found in Conway MacKenzie, Inc., October 2010, Review of the Events and Decisions That Have Led to the Current Financial Crisis of the Employees Retirement System of the Government of Puerto Rico available here.